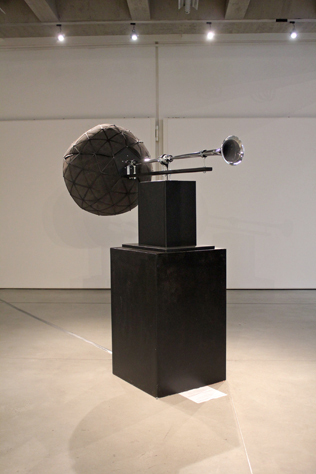 The 'whispering machine' converts spoken language - whether it is spoken, screamed or chanted - into a whispering. What is spoken into one horn is getting transformed immediately and displayed in form of a whisper through the second horn. When noone is speaking into the horn, the machine itself will start whispering short aphorisms and requests to speak. A convolution between the original sound and a high frequent noise converts the spoken language into a whispers.